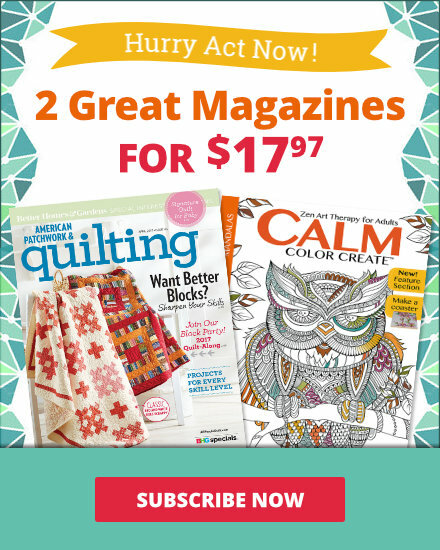 See the featured quilts and web-exclusive color options and projects from the American Patchwork & Quilting June 2015 issue. 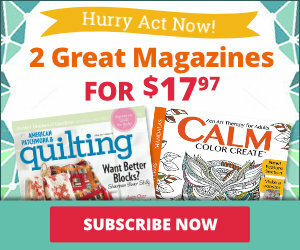 The June 2015 issue of American Patchwork & Quilting is on sale from April 7--June 2. 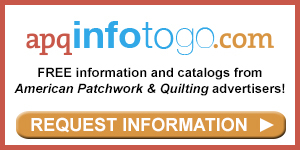 Designer Weeks Ringle of Modern Quilt Studio offers treatment plans to cure your quilt-fabric stash of its ailments and strengthen your color confidence. Designer: Carl Hentsch of 3 Dog Design Co. Wondering what to do with all of those big prints you covet? Fussy-cut them to create a kaleidoscope of color. Play with Xs and Os in a wall hanging that showcases fussy-cut sashing and blocks in a kaleidoscope of fresh colors. Although this analogous (neighbors on the color wheel) fabric combination uses small-scale, relatively low-contrast prints, it sparkles because it includes the lightest lights and darkest darks. We selected two background prints—a black and a black-and-teal—for this palette and wound up using both. 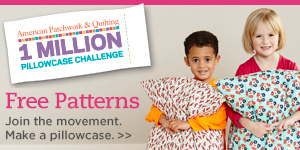 Make a baby quilt to cherish out of sweet florals and tone-on-tones in soft pastels. For her 42"-square quilt, quilt tester Laura Boehnke added a dash of red to the primarily low-contrast, soothing colors by cutting floral fabrics into tiny pieces for the pieced rectangles, hourglass units, and Square-in-a-Square units. While a common approach to dealing with a bold geometric print—used here in the sashing rectangles—would be to add coordinating tone-on-tone fabrics, for this color option we chose bolder multicolor fabrics in a range of styles to complement the geometric. Because all the fabrics are bold, the pieced Churn Dash blocks balance the high-contrast sashing. A simple yet graphic throw shows it’s possible to successfully combine wovens and prints. A neutral solid marries the playful fabric mix. Assemble hourglass blocks from bright fabrics and float them atop a black background for a graphic wall hanging. When faced with a large-scale complex print, many quilters consider combining it with small-scale quiet prints that can function as supporting characters. Weeks Ringle recommends using more bold-design prints that can hold their own against the dramatic large-scale print. The table runner illustrates her point. To offset the robust mix of prints, a barn red tone-on-tone separates the prints in each block. The rectangles at each end are the perfect places to feature a large chunk of the main print. Frame hourglass units of gold and olive green with a bevy of madder red triangle-squares. Piece borders from the same triangle-squares to continue the theme. Reproduction 1930s prints can be challenging to combine with other fabrics because they usually have a great deal of white in them. When mixing prints, consider the foundation color and remember that white-based prints will be more cohesive when grouped, as will ivory-based prints, tea-dyed prints, etc. We auditioned several prints for the background of this table runner version of Richly Red, ultimately choosing a blue tonal we thought highlighted the mix of 1930s prints and other fabrics. Triangles of all sizes combine for a stunning wall hanging. Beautiful red, purple, and pink prints create interest while wide cream and brown borders show off the quilting. You'll quickly make headway on this easy-to-navigate table mat. Add depth to it with dimensional details on the anchors and sails. Snowball units and strips arranged in an orderly fashion pop off a print background. Quilt tester Laura Boehnke stayed true to the original design but utilized fabrics with an Asian flair for her version of Along Those Lines. The dark background with metallic accents provides a platform for the strips and Snowball blocks to shine. In keeping with Weeks Ringle's advice not to pigeonhole Civil War-reproduction prints, we evaluated the hue, value, and saturation of our selected fabrics and opted to use a smaller palette for this color option. For this version, we modified the original design by omitting the strips. We made four Snowball-only sections, adding bonus Snowball blocks to fill the void of the absent strips. Cleverly rotary-cut your blocks from black-and-white prints to launch a floral explosion. Bright batiks make a bold impact in quilt tester Laura Boehnke’s 43"-square version of Black, White & Bright. Some of the batik flower appliqués show up better than others on the intense blue border fabric. Instead of blanket stitching, Laura satin-stitched around each appliqué with thread that matched the appliqué. Although initially planned as a low-contrast quilt of one floral—the fabric used for the outer border—and three small-scale coordinating prints, the final palette includes some unlikely pairings. The selected prints, batiks, stripes, and plaids all add movement, visual texture, and a little more variety in scale and contrast. Get te digital issue here. Get out your scraps of feed sack and 1930s reproduction prints. The 1-inch squares in this throw are ideal for even the smallest pieces. While this nine-block version of Thirty Something is scrappy like the original, quilt tester Laura Boehnke controlled the color palette more, limiting it to red, green, brown, and tan. She used all the darker colors in the 16-Patch blocks but decided not to use red in the setting blocks, saving it for pops of color in the "sashing squares" (the Four-Patch unit in each modified Churn Dash block). To give the large-scale patterns a place to shine, we replaced the 16-Patch units in Thirty Something with 4-1/2" squares. To balance the mix of large-scale prints, we added several smaller-scale multicolor prints and solid khaki. 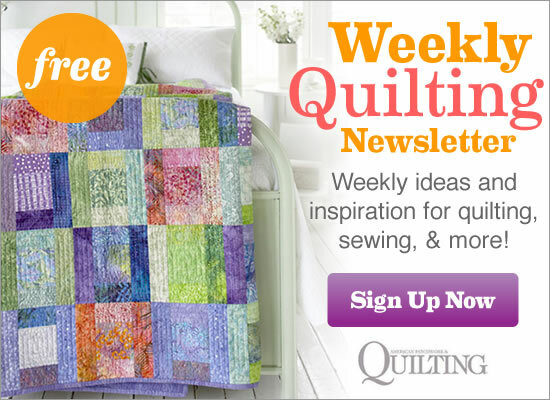 Transform scrap-basket leftovers into a bed-size quilt that sparkles. Colors that don’t match perfectly and a variety of lights, mediums, and darks give the quilt its effervescence. A punch of citron highlights prints ranging from light gray to black in this 48"-square version of Stars & Scraps Forever. The same print composes the center squares in both the light and dark star blocks. After cutting the 4-1⁄2" squares for the centers, we selected the lightest eight for the light star blocks and the darkest eight for the dark star blocks. Jean Wells teaches you how to expand your piecing horizons with a new technique she calls skinny insert strips and shows you how to play with color at the same time. Earn the joy of hand piecing with this little gem, which is reminiscent of a Grandmother’s Flower Garden pattern. Each “flower” is made of six jewel shapes. For the outer border of her rendition of Jewel Box, quilt tester Laura Boehnke chose a multicolor collage print of stripes and other geometric shapes. This print offered multiple opportunities to fussy-cut pieces for the blocks. If you think you can’t combine multiple florals in a quilt, consider this version. The similarly saturated floral fabrics actually work together, rather than competing with each other, to make a bold bouquet. Put a spin on the Black, White & Bright quilt as Joanna Figueroa did with half-size blocks made in three colors instead of two.